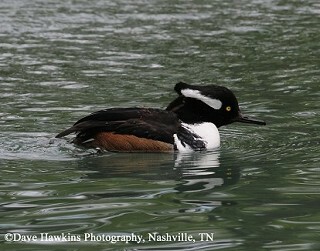 The Hooded Merganser is thought by many to be the most beautiful of all waterfowl. The male has a large fan-shaped crest with a large white patch, which he will raise during courtship and aggressive interactions with other males. This fish-eating diving duck inhabits wooded swamps during the breeding season and nests in holes in trees. It breeds in forested wetlands across most of eastern North America with a disjunct population in the Pacific Northwest. In winter it can be found in forested freshwater wetlands, brackish estuaries, and tidal creeks in the eastern and southeastern United States and from northwestern Canada to southern California. Small numbers of Hooded Mergansers nest in Tennessee, and they are fairly common in the state during the non-breeding season. Description: Both the male and female of this small diving duck have a fluffy, fan-shaped crest that can be raised and lowered. The male is boldly patterned with a black head and large white patch on the crest. His back is black, the sides are rust-colored, and the chest is white. The female is overall brownish with a smaller rusty crest. In flight, both male and female show a small white patch at the base of the wing. The wings produce a loud whistling in flight. Male Bufflehead have a larger white patch that wraps around the back of the greenish head, and the body has white sides. The female has an oval white cheek patch. Female Wood Ducks differ from female Hooded Mergansers as they have a grayish head, a much smaller crest, and a white patch around the eye. Other female mergansers are much larger, have a thinner crest, and have red on the bill. Habitat: Breeds in forested wetlands. In migration and in winter found in a variety of open-water habitats. Diet: Primarily small fish and aquatic invertebrates. Nesting and reproduction: Females first breed at two years of age. Males abandon the females shortly after incubation begins. Clutch Size: Usually 10 to 12 eggs, with a range of 7 to 13. The eggs are unusual in that they are nearly spherical. Incubation: The female incubates the eggs for about 33 days. Fledging: Ducklings leave the nest within 24 hours of hatching. The female calls to them from the water below the cavity, and the young jump from the cavity to join her. They are able to feed themselves from the first day. Nest: The nest is in a hollow tree close to or over water. The only material that the female adds is down plucked from her belly. Hooded Mergansers also accept nest boxes. Status in Tennessee: The Hooded Merganser is a year round resident of Tennessee, locally rare in summer, uncommon in winter, and fairly common during migration. Migrant and wintering birds are usually found in small flocks throughout the state and are present from late October through early May. Nesting is primarily in bottomland hardwood forests in West Tennessee. Like many species of ducks, Hooded Mergansers occassionally lay their eggs in the nests of other ducks, and in turn, other species lay eggs in their nests. This is called nest parasitism. Species that Hooded Mergansers are known to have parasitized and have parasitized them include Common Goldeneye, Common Mergansers, Wood Ducks, and other Hooded Mergansers. The oldest known wild Hooded Merganser was 11 years, 6 months old. Best places to see in Tennessee: Most easily seen during the non-breeding season on ponds, lakes and wooded swamps across the state. Nesting occurs at Reelfoot Lake, Hatchie NWR, Meeman-Shelby Forest State Park, and other West Tennessee bottomland and wooded swamp locations. Dugger, B. D., K. M. Dugger, and L. H. Fredrickson. 1994. Hooded Merganser (Lophodytes cucullatus). The Birds of North America, No. 98 (A. Poole, and F. Gill, eds.). The Academy of Natural Sciences, Philadelphia, PA, and The American Ornithologists' Union, Washington, D.C.